De regio rond de Nieuw-Zeelandse stad Christchurch is opnieuw getroffen door een zware aardbeving. Het epicentrum van de schok lag enkele tientallen kilometers ten noorden van de stad. Over slachtoffers of schade is nog niets bekend. De aardbeving had volgens het USGS een magnitude van 7.4 en de schok vond plaats op tien kilometer diepte, net na middernacht (lokale tijd). Volgens de Nieuw-Zeelandse autoriteiten is er geen tsunamigevaar. In 2011 werd Christchurch al getroffen door een zware aardbeving. Toen kwamen 185 mensen om het leven en werd grote schade aangericht. De aardbeving van 2011 had een magnitude van 6.3 en vond plaats op vijf kilometer diepte. Aan de oostelijke kust van Nieuw-Zeeland is een eerste tsunamigolf gesignaleerd, na de zware aardbeving van enkele uren geleden. Het is niet duidelijk hoe groot die golf was en of die schade en slachtoffers heeft gemaakt. De beving zelf had een kracht van 7.4, maar heeft vooralsnog enkel materiële schade veroorzaakt. De eerste golf trof de noordoostelijke kust van het zuidelijke eiland van Nieuw-Zeeland. De plaatselijke autoriteiten waarschuwen dat de eerste golf niet noodzakelijk de grootste is, en dat de tsunamiactiviteit mogelijk nog uren zal aanhouden. Mensen uit de kustgebieden in het oosten wordt dan ook met aandrang gevraagd om hoger gelegen gebiedne op te zoeken. Het tsunamialarm werd aangekondigd na de zware aardbeving van eerder vandaag. Die had een kracht van 7.4 en gebeurde op zo'n 91 kilometer ten noordoosten van de stad Christchurch. Er zijn op dit moment enkel meldingen van wat materiële schade. Bewoners getuigen dat de beving vrij lang duurde. Ook in de hoofdstad Wellington - op zo'n 300 kilometer van Christchurch - werden gebouwen doorheen geschud. Op Twitter zijn al foto's gedeeld van de schade. Mensen zijn in paniek op straat gevlucht, ook uit schrik voor de naschokken. De regio wordt vaker getroffen door aardbevingen. In 2010 en 2011 raakten heel wat historische gebouwen beschadigd en vielen ook verscheidene doden. 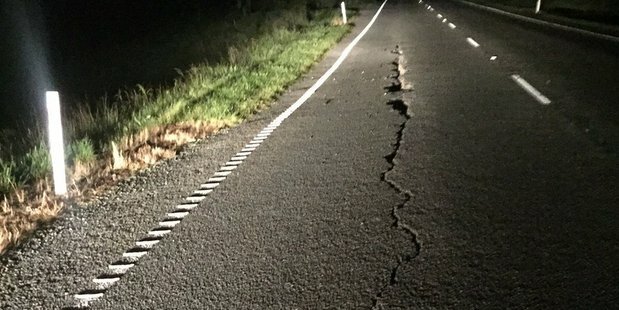 Ultra-sensitive fibre-optic sensors extending nearly a kilometre below the Southern Alps will transform what we know about one of the biggest earthquake threats facing New Zealand. 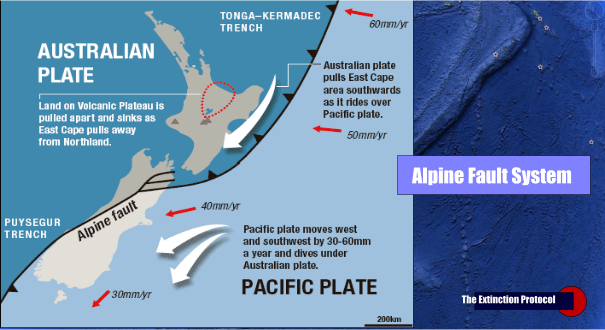 The Alpine Fault, which runs along the spine of the South Island, is assessed by scientists to be likely to produce a large earthquake in coming decades, a potentially catastrophic event that would change the face of the country. 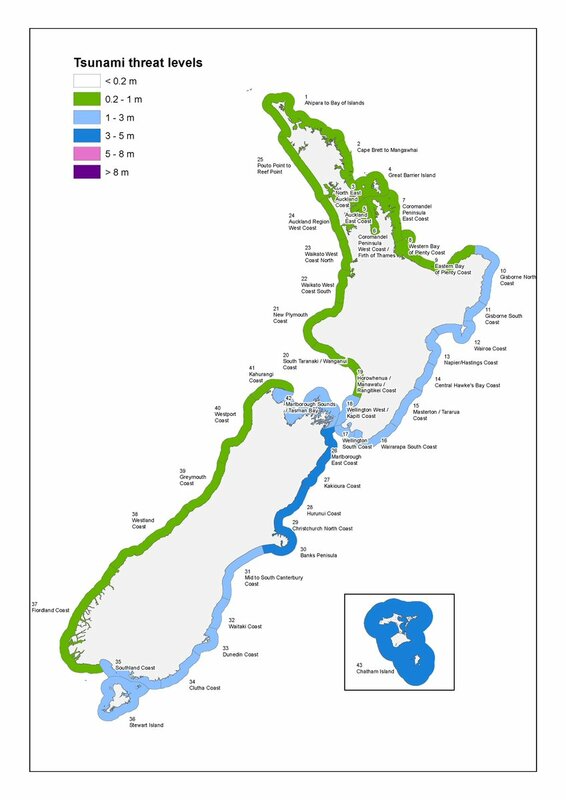 On average, quakes of magnitude 7.5 or larger strike along the Alpine Fault about every 300 years, and the last big event, measuring about magnitude 8.0, occurred 299 years ago. Scientists calculate there's a 30 per cent of a big quake within the next 50 years, a fact that's put a sense of urgency behind efforts to better understand the complex system. In a new project, just awarded a $830,000 Marsden Fund grant, researchers will make use of optical fibre equipment already installed in a 900m borehole drilled into the Alpine Fault to gain crucial insights into what's happening deep underground. The borehole was drilled at Whataroa Valley, north of Franz Josef Glacier, in 2014 as part of the international, multi-million dollar project focused on understanding how the Alpine Fault produces earthquakes. The borehole revealed unusually high temperatures just several hundred metres below ground. emperature is an important characteristic of the fault - hot rock brought to the surface as the Southern Alps are uplifted interacts with groundwater. The sensor technology being developed is sensitive enough to detect subtle changes in temperature - potentially providing a way of monitoring the fault's state of health - and seismic waves produced by earthquakes. University of Auckland physicist Professor Neil Broderick said the technology worked by picking up changes in the properties of short pulses of laser light sent down the optical fibre. The data it produced would be detailed enough to record signals produced by small, high-frequency quakes and recently-revealed deep, low-pitched earthquakes, complementing measurements made with conventional seismometers. Broderick, who is leading the study, said the approach had been adapted from one used by the petroleum industry to detect and monitor oil drilling. The basic concept has been around for 20 years, but we are looking to push it to new levels of sensitivity and capability." Victoria University of Wellington earthquake scientist Associate Professor John Townend, a lead researcher in the drilling project and the new Marsden Fund project, said the prospect of keeping a close eye on these mysterious, deep quakes was exciting. "It would be great to be able to keep tabs on earthquakes and changing temperatures inside the fault zone - not every millisecond, perhaps, but every few minutes or several times a day." 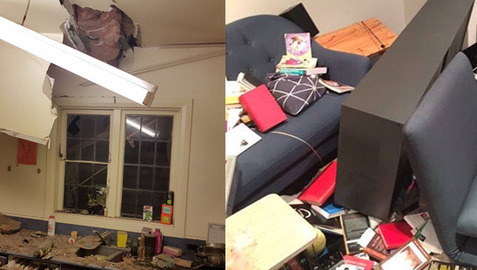 The new measurements offer the prospect of breakthroughs in understanding the conditions that control earthquake triggering - even if they didn't provide specific warning ahead of the next big quake, Townend said. "We're a long way off being able to say when an earthquake will occur, but these sorts of continuous measurements will greatly improve our understanding of what factors are important and what straws break the camel's back." • Is the on-land boundary between the Pacific and Australian tectonic plates. • It moves about 27m horizontally every 1000 years, in three or four separate large ruptures. • Scientists have evidence that it has ruptured 24 times in the past 8000 years, with the average interval period about every three centuries. • It last ruptured in 1717, or 299 years ago, and has a 30 per cent probability of rupturing in the next 50 years, which is high by global standards. • According to GNS Science, this rupture would produce "one of the biggest earthquakes since European settlement of New Zealand", and will have "a major impact on the lives of many people". A team of scientists drilling deep into the South Island's high-risk Alpine Fault have been intrigued to encounter unusually high temperatures just several hundred metres below ground. As of this morning, the landmark drilling project at Whataroa Valley, north of Franz Josef Glacier, had reached a depth of about 490m and had encountered temperatures of more than 60C. The multinational project, which has a goal of drilling 1.3km into the earth, would ultimately allow scientists to install monitoring equipment into the fault, where small earthquakes, temperature, pressure and chemical conditions could be studied. By comparing rocks retrieved by drilling with rocks exposed at the surface, the research team hope to discover how the earth's crust deformed during earthquakes. The project would be one of the first attempts to probe the inside of a major fault before it ruptures, and would give important insights into the chemical and physical changes occurring at various depths inside the fault zone. One of the project leaders, Dr John Townend of Victoria University, told the Heraldthe temperatures of rock and fluid recorded so far had been higher than expected. "This has technical implications, as we will need to ensure our equipment can withstand those temperatures, but also some really important scientific implications," he said. "We are very interested in the conditions under which earthquakes occur. Basically, if rocks get too hot, the earthquake activity stops." At 8-10km below the alps, earthquakes stopped occurring because rock at that depth stopped snapping against itself, and instead tended to flow like putty. So understanding the thermal structure of the fault is quite important for understanding how deep seismicity might go in future big quakes, and at this point we are making a lot of measurements." At previous borehole drills, the temperatures tended to rise by about 62C per kilometre drilled. "What we have found here is that we are already at that, but with only a 400m depth, so we can see it's that much hotter." However, the team did not expect that temperature rate to continue. Dr Townend said despite a delay in drilling, the project had made good progress and in just a few days had burrowed through 100m of earth. "At some point, when we think we are getting near the interesting bit, we will switch over to a different mode of drilling. "That will generate core, which will provide a humongous amount of extra detail, because we will have the whole rock to look at." The team had expected to pass through the fault at some point this month. The borehole location was regarded by scientists as one of the best sites in the world to study the inner workings of a major plate boundary fault. In parallel with the drilling operations, the science team has set up a sophisticated field laboratory for processing and analysing rock and fluid samples and digital data from the borehole. The laboratory equipment included a mass spectrometer and gas chromatograph used to provide continuous measurements of gas chemistry and a core scanner that produces high-resolution images of core samples. There was also an on-site facility to make microscopic slides of the rocks gathered within only a few hours of them having been ground up by the drill bit hundreds of metres below the surface. The project is being jointly led by GNS Science, Victoria University of Wellington, and the University of Otago and is funded mainly by the International Continental Scientific Drilling Program, the Marsden Fund of the Royal Society of New Zealand, and the participating scientists' own organisations. It involves scientists from New Zealand organisations and from more than a dozen other countries. • It moves about 27 metres horizontally every 1000 years, in three or four separate large ruptures. • Scientists have evidence that it has ruptured 24 times in the past 8000 years, with the average interval period about 330 years. • It last ruptured in 1717, or 297 years ago, and has a 28 percent probability of rupturing in the next 50 years, which is high by global standards. Drie koeien hebben door een wel heel gelukkige speling van de natuur de zware aardbeving van gisteren in Nieuw-Zeeland overleefd. Het weiland in de plaats Kaikoura waarin de koeien stonden werd na de beving getroffen door een grote aardverschuiving. Maar precies die paar vierkante meter waar deze dieren stonden, bleven als door een wonder overeind staan. De aardbeving is een grote strop voor de vele melkboeren in deze regio van Nieuw-Zeeland. Door schade aan de infrastructuur kan bij veel boerderijen geen melk worden opgehaald. Boeren moeten hun melk daardoor lozen. Volgens de krant The New Zealand Herald gaat het nog wel even duren voordat de melkproductie weer op gang komt. Terwijl een zoektocht wordt gehouden naar een aantal vermisten, houdt Nieuw-Zeeland rekening met een nieuwe aardbeving op korte termijn die mogelijk net zo zwaar is als die van de afgelopen nacht. GeoNet, het seismologisch bureau van de overheid, zegt dat de kans op weer een zware aardbeving de komende 24 uur op 12 procent ligt. 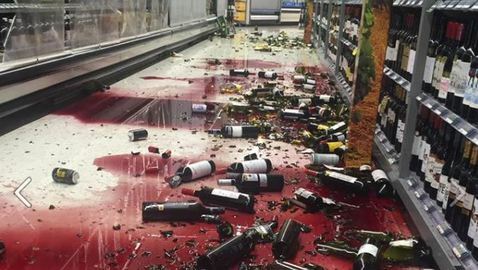 Die zou zich kunnen voordoen in het gebied tussen Christchurch en Wellington, de regio die kort na middernacht (plaatselijke tijd) werd getroffen door een aardbeving van 7,5 op de schaal van Richter. Kort na het middaguur zijn naschokken van 6,2 en 6,3 op de schaal van Richter geregistreerd. Het officiële dodental ligt nog steeds op twee. Op het Zuidereiland wordt, in de buurt van de toeristische kustplaats Kaikoura, werd gezocht naar zes vermiste kajakkers. Ze bleken een veilig heenkomen gezocht te hebben in hoger gelegen gebied. Ook 16 buitensporters in de buurt van de buiten zijn oevers getreden Clarence River hebben zichzelf in veiligheid kunnen brengen. Een vrachtwagenchauffeur van wie werd gevreesd dat hij bij Kaikoura met zijn truck onder een aardverschuiving was beland, meldde zich ongedeerd bij de politie. Een aantal belangrijke wegen is afgesloten door verzakkingen, scheuren en aardverschuivingen. Wegverkeer tussen Christchurch en Picton, waarvandaan de veerboot naar Wellington vertrekt, is praktisch onmogelijk. Niet alleen op het Zuidereiland, maar ook in de hoofdstad Wellington op het Noordereiland is de schade aanzienlijk. Het centrum was tot het eind van de middag afgesloten. In de buurt van de haven zijn veel wegen en straten beschadigd. Ook de terminal van de Interislander, de veerverbinding tussen het Noorder- en Zuidereiland, heeft schade opgelopen. Christchurch, de stad waarvan het centrum in 2011 door een reeks aardbevingen werd verwoest, is ditmaal niet getroffen. Wel moesten inwoners van wijken aan de kust het 's nachts hogerop zoeken in verband met tsunamigevaar. Een tsunamialarm was afgekondigd voor de uitgestrekte oostelijke kustlijn van Nieuw-Zeeland, maar werd in de loop van de dag ingetrokken. In het kustgebied tussen Kaikoura en Wellington wordt later vandaag zware storm verwacht. Dat zal reddings- en bergingswerkzaamheden bemoeilijken. In Nieuw-Zeeland is een dam gebroken nadat het land maandag werd opgeschrikt door flinke naschokken. Zes mensen die aan het kajakken waren werden vermist maar zijn inmiddels weer veilig teruggevonden. Ze hadden hogerop een veilig heenkomen gezocht. Een andere groep van zestien rafters werd ook veilig teruggevonden door de reddingsdiensten. De dam was ontstaan door puin dat in de Clarence River was gevallen. Het water hoopte zich op totdat de natuurlijke barrière het begaf en het water met grote hoeveelheden naar beneden stortte. De autoriteiten adviseren inwoners hun heil hogerop te zoeken. Nadat een zware aardbeving maandag (lokale tijd) voor twee doden had gezorgd, zorgden veel naschokken opnieuw voor problemen. Het Amerikaans geologisch onderzoeksinstituut noteerde onder meer een beving met een kracht van 6.2. Het epicentrum lag wederom in de buurt van het Zuidereiland op een diepte van 10 kilometer, ongeveer 120 kilometer ten noordoosten van Christchurch. Na de eerste beving met een kracht van 7.9 ontstonden hoge golven van 3 tot 5 meter die in de nacht van zondag op maandag (plaatselijke tijd) op meerdere plekken de kust van Nieuw-Zeeland bereikten. Volgens premier John Key loopt de schade van de beving in de miljarden dollars. Vooral wegen raakten zwaar beschadigd. Het zal maanden kosten voordat alles is hersteld, aldus Key. Het is niet de eerste keer dat Nieuw-Zeeland getroffen wordt (zie kaartje hieronder) en het zal zeer zeker ook niet de laatste keer zijn. Twee schepen van de Nieuw-Zeelandse marine hebben de kustplaats Kaikoura bereikt. Daar zitten sinds de aardbeving van afgelopen weekend meer dan duizend mensen vast, onder wie tientallen Nederlanders. De schepen halen niet alleen mensen uit het gebied, maar hebben ook eten en water aan boord. Daar is een groot tekort aan in Kaikoura, een toeristenplaats aan de oostkust van het Zuidereiland bekend van walvissafari's. De gestrande Nederlanders in Kaikoura, zo'n zestig, zullen waarschijnlijk niet met de marineschepen worden geëvacueerd. Reisorganisatie Travel Essence heeft een vliegtuigje gehuurd om hen op te halen. De organisatie besloot daartoe omdat het erop leek dat de marineschepen pas veel later zouden aankomen in de regio. Er waren al zo'n 400 mensen met helikopters geëvacueerd. Twee mensen hebben de beving niet overleefd. Hoe groot de schade is, is nog onduidelijk, maar het loopt in elk geval in de miljarden. Later vandaag verwachten de Nieuw-Zeelandse autoriteiten satellietbeelden binnen te krijgen van het getroffen gebied. In Kaikoura, maar ook elders in het land, zijn grote aardverschuivingen geweest. De aardbeving van 7,8 op de schaal van Richter heeft de zeebodem maandag op sommige plaatsen tot bijna twee meter hoger gestuwd. Anna Richmond postte op Facebook surreële foto's van de geologische gevolgen daarvan. Met buitengewoon, science fiction-achtig zeeleven dat we nog nooit zo zagen en dat we eigenlijk ook niet zo horen te zien. Duizenden zeeoren kwamen aan de oppervlakte na de aardbeving. © Anna Redmond/Facebook. Maar voor wetenschappers zijn het interessante en intrigerende gegevens om te onderzoeken. Ze krijgen een hallucinante maar unieke inkijk in wat zich normaal uitsluitend onder water op de zeebodem, diep onder de aardoppervlakte, afspeelt. Volgens Nieuw-Zeelandse experten is het de eerste keer dat dit in hun land gebeurt tijdens de laatste decennia. "Coseismische beweging, het seismisch vrijkomen van energie langs breukvlakken, is de oorzaak van dit fenomeen", verduidelijkt zeegeoloog Joshu Mountjoy.